Seriously, little pranks like making the top of Charlotte’s head into a duck’s nest are the only way I can make this helmet torture + eating nightmare bearable. I know some of you think this thing is cute and I greatly appreciate that you are not trying to tell me that. Even Pat, Charlotte’s orthotist agrees–the helmets are not cute. 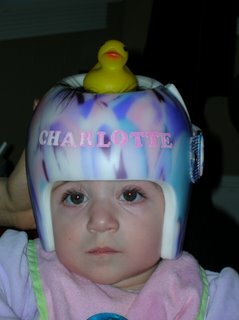 Simply put, Charlotte is adorable in spite of the helmet. The helmet certainly does not enhance our gorgeous baby’s looks. Her huge peepers and long eyelashes, however, do enhance the evil beret. Anyway…Charlotte had her first helmet re-fitting today. Her head grew 2mm and the shape is shifting nicely. Pat said that if she continues at this rate she might get out of the helmet sooner than Mommy thinks. Also, Charlotte was evaluated by Cheryl, an Occupational Therapist yesterday. She was found to be right at 8-8.5 months milestones! Occupational therapists look at motor skills as they relate to visual discrimination and at shoulder girdle strength. Charlotte is alert and aware of her environments, grabs at toys with her fingers, bangs toys around, watches toys, follows a person speaking, etc. Cheryl determined that no OT will be necessary for Charlotte at this point. At last, a little bit of good news. It’s the little things in life. One therapy down…Charlotte, your fairy godmother thinks you’re absolutely adorable in your crown (sorry, Mommy, I get to say it!). As long as it’s working, who cares what it looks like. She’s beautiful no matter what you put on her head!